Smart surgery brings us a new era of intelligent medical technology that provides surgeons with real-time information and improves decision making in the operating room and across the continuum of care. Here at Sagentia we’re seeing how smart surgery has shifted from future-gazing to reality, influencing and impacting the surgical environment from improving patient outcomes and minimising repeat surgeries to reducing healthcare costs. The smart surgery roadmap spans all surgical disciplines across every medical technology offering and includes everything from robotics, smart surgical instruments, novel visualisation systems, augmented reality to imaging, sensing, software and live data. 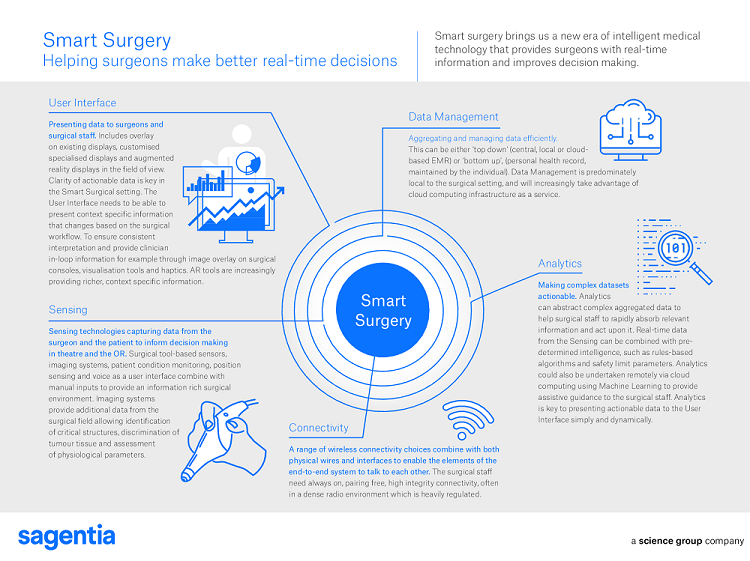 Our infographic shows the elements of smart surgery and how they come together to bring us a new era of intelligent medical technology that provides surgeons with real-time information and improves decision making. At Sagentia, we thrive on applying science and technology to not only meet the needs of a smart surgery environment – but also to drive it. We work with our clients / you to develop solutions that are not only safe and effective, but that give the best possible user-experience, whoever they are. We also understand the stringent needs of this highly regulated environment and are ISO 13485 accredited for medical device development. We work at every stage of medical device development from helping clients solve a specific science and technology challenge, through to delivering a comprehensive design and development programme, as well as prototype creation and transfer to manufacture. We’re able to do this because our track record, expertise and experience includes, amongst others, in vitro diagnostic devices, surgical instruments, advanced drug delivery technologies, and connected health applications. We're curious and creative about the world of smart surgery and this influences how we approach medical product development challenges: where we are now and where we do we want to be in the future. Our long-standing relationships with clinicians, teaching hospitals and academia also ensures our insights and recommendations are even richer and more relevant. Could you work with a robot?